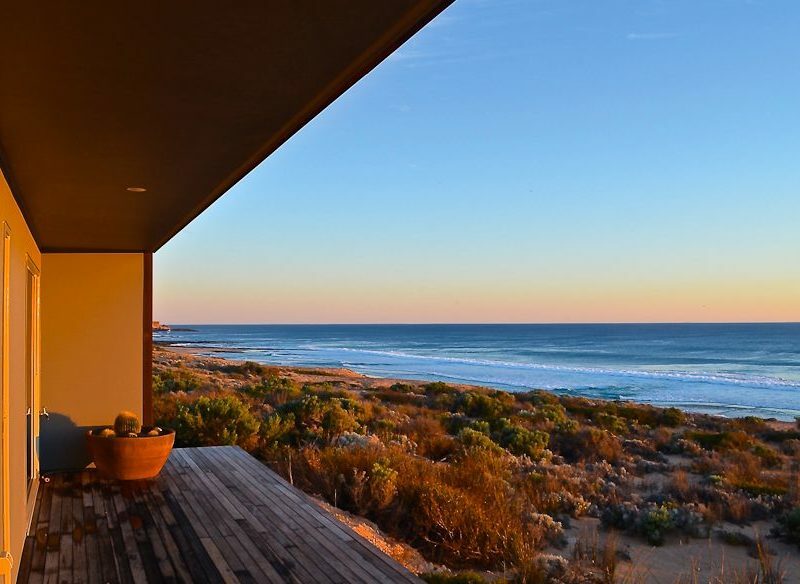 Delightfully remote: Camel Beach House, Venus Bay, SA. Now this is one fancy humpy. Inspired by Storm Boy – more so for its location, we’re assuming, than its looks – and the owners’ exotic global lifestyle between Mexico and Australia, the modern Camel Beach House sits perched on the southern tip of a wild 250-acre property on SA’s Eyre Peninsula. 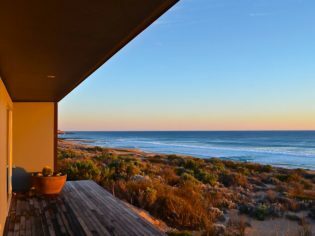 In complete contrast to the natural landscape, this box-like home sleeps four people in two designer-linen-clad queen beds, has a modern kitchen with an all-important wine cooler, funky and comfy interiors, and a day bed from which to watch the crashing Southern Ocean of the Great Australian Bight. Turn the other way and it could feel like you’re in a desert landscape – except for that wonderful cool ocean breeze. Your own private stretch of the Southern Ocean from Camel Beach House, Eyre Peninsula. Keep your eye out for southern right whales which migrate here between May and October. The area is also home to several threatened species including the white-bellied sea eagle, osprey and the Australian sea lion – you can even swim with these cheeky animals in Port Lincoln, just a two-hour drive from here. The closest civilisation, however, is the small fishing town of Streaky Bay (the end-point of the Eyre Peninsula’s Seafood Trail). Needless to say, the seafood there is incredible. Hop in the car for the 45-minute drive to pick up dinner: prawns, oysters, crab, or some of the freshest abalone you’ll try, harvested straight from the Streaky Bay sea floor by hand. Then head back to your fancy humpy and savour it with this view. From $275 per night, minimum two-night stay.